There is documentary evidence of three possible standing stones in the vicinity of Mitchell's Fold Tenement. Two of them survived into the 19th century. 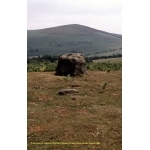 Scheduled Monument (standing structure): A single standing stone, believed to be an outlier of the main stone circle and therefore of probable Bronze Age date. A Middle Bronze Age looped palstave was found at depth of 18ins in a field on Mitchells Fold Tenement c 1880. It was given to Shrewsbury Museum.